Hells Canyon is the magnificent canyon carved by the Snake River that forms the eastern/western border of Oregon and Idaho. It has an incredibly rich natural and cultural history. 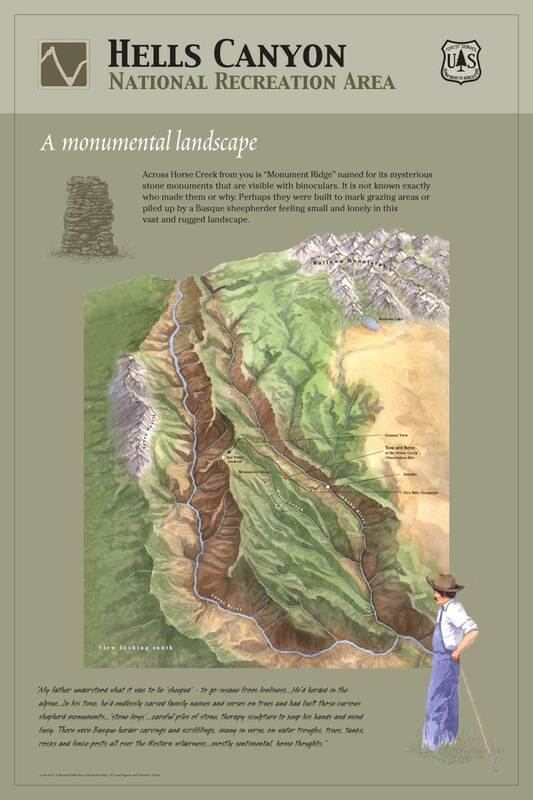 For this project with the U.S. Forest Service, I researched, wrote text, designed and illustrated a series of nine signs. Most of these signs focused on historical and cultural topics. Click on the image for a closer view. The images are watermarked with my signature – please do not download these images! Each sign featured a map showing the location of the sign and the various recreation opportunities nearby. 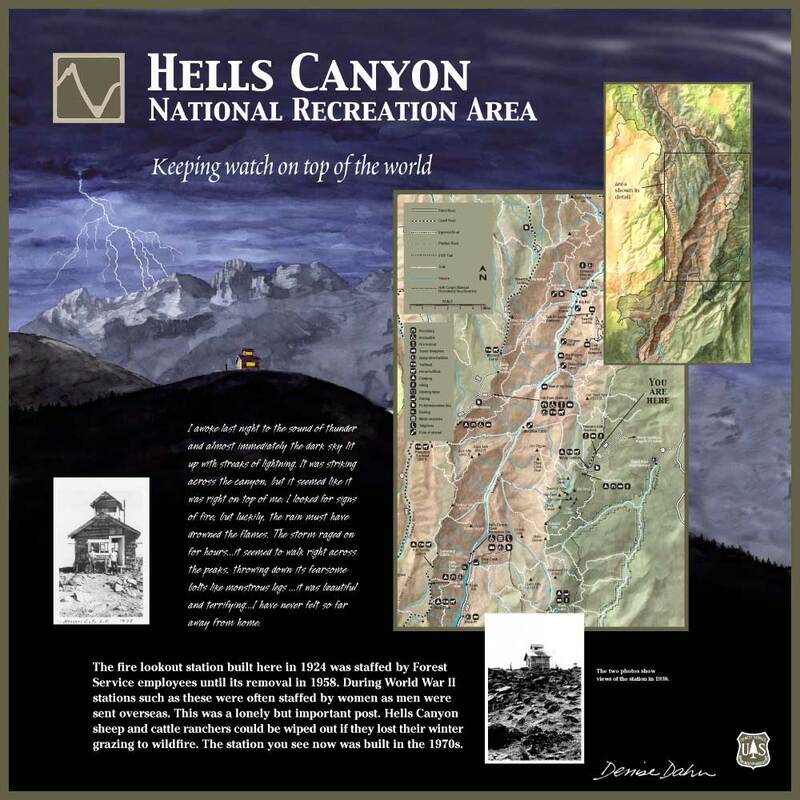 Hells Canyon has a rich heritage in sheep ranching. It was ideal because the climate at the bottom of the canyon stays much warmer and was a good place to winter the animals. In summer, they would herd them up to the mountains. Cattle ranching is big in Hells Canyon. 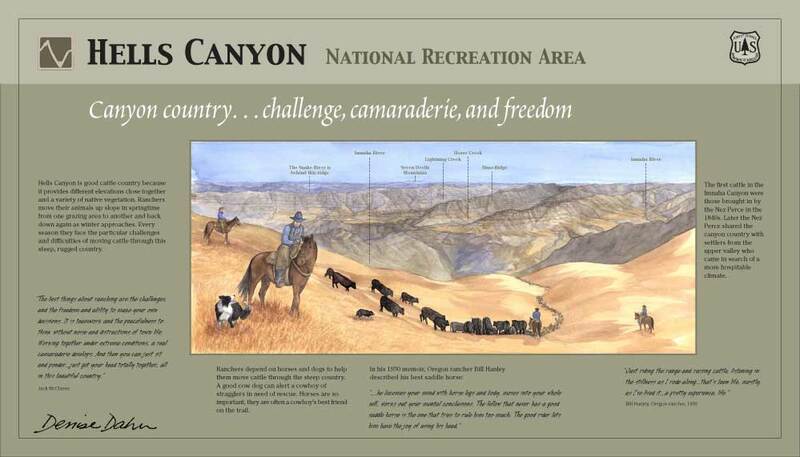 This sign shows the view from where you are standing looking over the canyon toward Idaho. As you stand there, it is amazing to think of herding cattle down that steep country.For this sign, I interviewed a rancher that had spent his whole life on the family spread which is now operated by his grown children. On the Idaho side of the Canyon there was a fire lookout. It was a secluded, lonely post, and the men who stayed there often wrote about the amazing storms they would witness. The mountains on the Idaho side, including the Seven Devils range, are quite tall, forming a massively tall side to the canyon.